Doing your own payroll is one way for business owners to save money. If you use QuickBooks Online, you can set up and run payroll easily in no time. We’ll show you what info you’ll need and provide step-by-step instructions on how to set up and process payroll in QuickBooks Online in nine easy steps. When you add Intuit Payroll to your existing QuickBooks Online subscription, your business gains access to benefits such as same day direct deposits, assistance with setting up your company’s payroll, and your taxes are prepared for you. Try Intuit Payroll free for 30 days. Doing payroll in QuickBooks online involves setting up QuickBooks Online Payroll, an easy process that has 5 steps, and running payroll in QBO, which is fast and be done in 4 steps. We’ll walk you through both step-by-step. In order to follow along, you’re going to need a few documents and pieces of information relating to your business and your employees handy. Below is a checklist that you can use to ensure you have everything you will need. You will need your business bank account and routing number of the bank account you will use to pay employees and make tax payments. In addition, you should have the hourly rate or salary information along with other benefits you will offer employees, such as health insurance and retirement plans. Bank Account Information: The full routing number and account number of the checking account that you will write payroll checks from as well as make your payroll tax payments. Tip: You should have a separate payroll account from the checking account that is used for your day-to-day business operations. Employee Compensation: Hourly wages, salaries, bonuses, commissions, tips, and any other compensation you provide your employees. Employee Benefits: Health and dental insurance, 401(k), retirement plans, vacation/sick leave policy, or Flexible Spending Account (FSA). 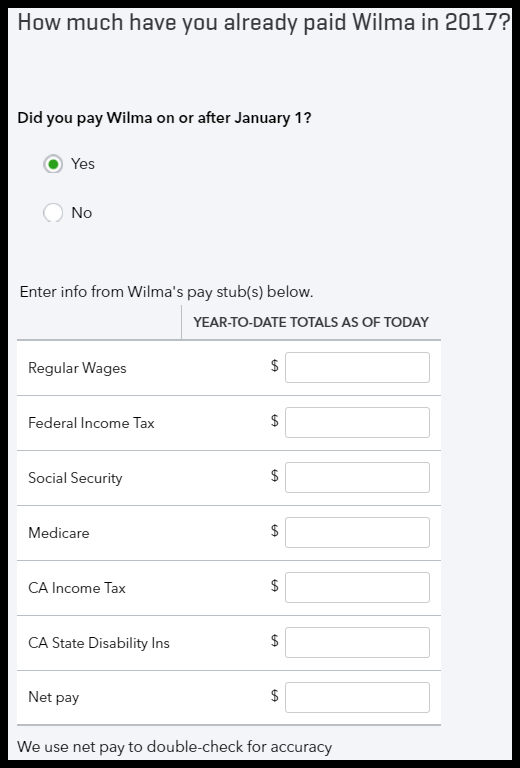 In order for QuickBooks to calculate payroll checks for you, you will need Form W-4, the employee’s pay rate and deductions, and how often you will pay employees (i.e., weekly, semi-weekly, monthly). Form W-4: Upon hiring a new employee, you need to have them complete a W-4 form, which will provide you with their withholding information and other pertinent information you need in order to correctly calculate their payroll tax deductions. Pay Rate: The hourly rate or salary you pay each employee, along with any bonus or commission pay, if applicable. Paycheck Deductions: Employee contributions to health insurance, retirement plans, or garnishments. Pay Schedule: In general, this will be weekly, bi-weekly, semi-monthly, or monthly. You can also set up multiple pay schedules if you need to in QuickBooks. For example, if you pay hourly employees every week and salaried employees every other week, you can set up both of these pay schedules. Sick/Vacation Hours Policy and Balance: If you offer sick/vacation pay, you will need to enter this information for each employee. In general, these hours will be earned each pay period. Tip: If you are converting to QuickBooks Payroll in the middle of a calendar year, be sure to enter the total sick/vacation hours an employee had from the old system. Hire Date: The hire date for each employee must be entered during the payroll setup. Direct Deposit Authorization Form: You can offer your employees direct deposit in lieu of a check. To do so, you must have them complete a direct deposit authorization form, which not only gives you permission to make deposits to their account, but it will include the bank account and routing information you need to make the deposit. Doing payroll in QuickBooks online involves setting up QuickBooks Online Payroll, an easy process that has 5 steps, and running payroll in QBO which can be done in 4 steps. We’ll walk you through both step-by-step. In this section, we will cover QuickBooks enhanced payroll service. 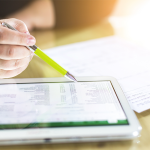 For a full guide to the features and benefits of the different payroll software offered by Intuit, check out our QuickBooks Payroll Service guide. Now that you’ve got all of the information you need, it’s time to roll up those sleeves and get to work! Click on the Employees tab located on the left menu bar as indicated in the screenshot below. Navigate to the Employee Center in QuickBooks Online. Begin the Payroll Setup process in QuickBooks Online. 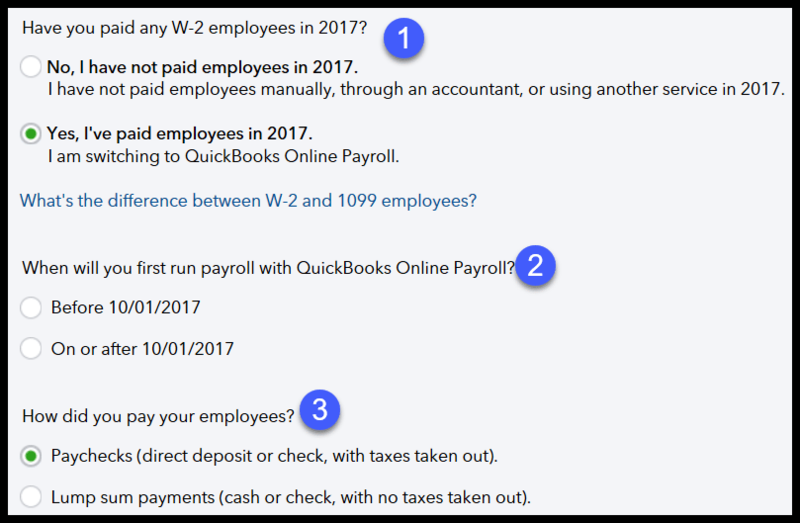 If you are converting to QuickBooks from a manual or computerized payroll system, then you will need to provide some additional information to ensure that your W-2 forms are accurate. You will need to provide information about any payroll checks issued during the year. Indicate if Prior Payrolls have been run during QuickBooks Payroll Setup Process. When will you first run payroll with QuickBooks Online Payroll? – Indicate the date that you plan to run your first payroll in QuickBooks. The options that appear here will be based on the current date. Tip: If you selected “no” to the first question, you will not see this question. How did you pay your employees? – Indicate the manner in which you paid your employees in your manual/old system. Your response to this question is very important because if you paid employees and withheld taxes from their paychecks, you will need to provide the year-to-date payroll information for each employee later on in the setup. Tip: This information should be readily available from the last payroll check that you processed for each employee. Set up employees in QuickBooks Online for Payroll setup. Complete Employee Information Section for QuickBooks Payroll Setup. Employee Withholding Information – This information will come from Form W-4, which we discussed earlier. When you click on the edit pencil, the above screen will display. Employee Pay – Enter the employee’s wage in this field. Tip: If you need to add more pay types, just click the Add additional pay types link directly below this field. Employee Deductions/Contribution – Select the deductions/contributions for the employee as indicated in the screenshot below. Payment Method – Select either direct deposit or live check from the drop-down. If you select direct deposit, enter the employee’s banking information directly from the direct deposit authorization form we discussed previously. Enter Year-to-Date Payroll Totals as part of Payroll Setup Process in QuickBooks. Tip: It is extremely important that you ensure the year-to-date totals are accurate. This information will impact federal and state taxes that have an annual maximum as well as limits on contributions to 401(k) and retirement accounts. 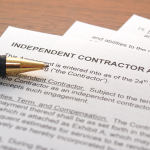 Check out our Small Business Payroll guide to learn more about deduction/contribution limits. Sample Payroll Check Run in QuickBooks Online. Now that you’ve got all of your employees set up, the next step is to run your payroll. 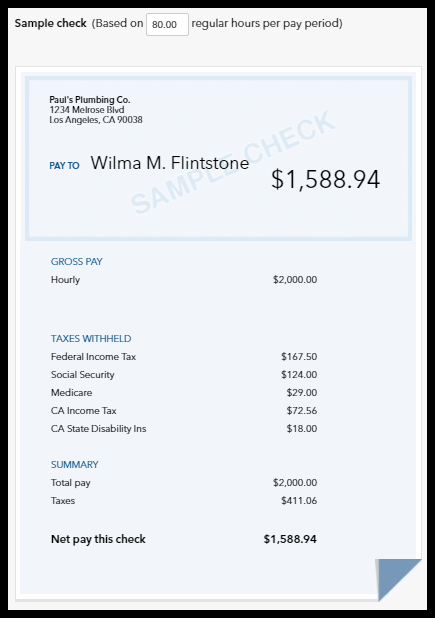 In this section, you will enter payroll hours, and QuickBooks will automatically calculate payroll checks and payroll taxes for you. You can print checks or submit direct deposit payments to employees. Run Payroll from the Dashboard of Employees in QuickBooks Online. Enter Current Payroll Hours in QuickBooks Online. Bank Account – The bank account that payroll checks and taxes should be deducted from should appear in this field. If the bank account you see here is not correct, select the correct account from the drop-down arrow. Pay Period – This field will populate with the pay periods you set up in the last section. If it is not correct, you can select the correct pay period by clicking on the drop-down arrow. Pay Date – This field should be the date you will pay your employees. You can edit this field if it is not correct. 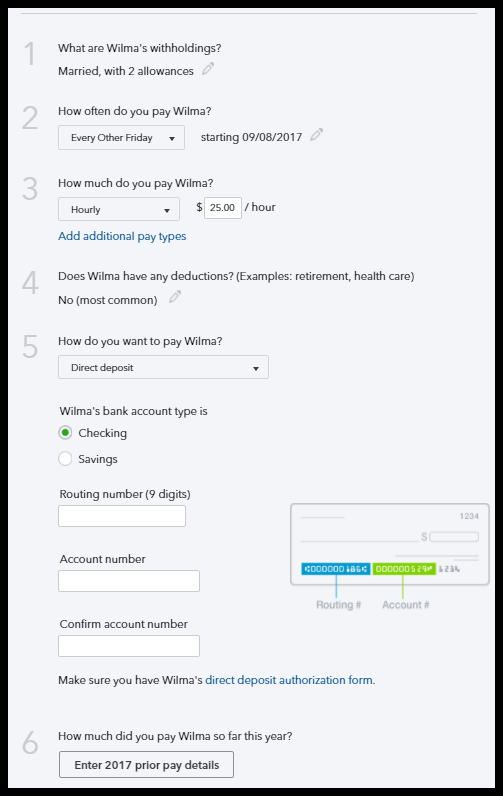 Hours Worked – You will need to enter the hours worked for the current pay period for all hourly employees (like Wilma in our example above). 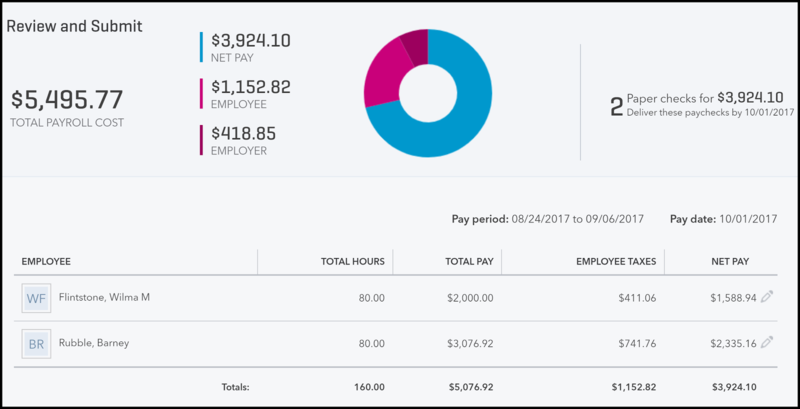 Salary Employees – The total pay will be automatically calculated for you based on the annual salary you entered for the employee during setup (like Barney in our example above). You should at least eyeball this to make sure it looks correct. Total Pay – This column represents the gross pay for all employees for this payroll. Review and Submit Payroll in QuickBooks Online. If you’re satisfied that everything is correct, click the submit button located at the bottom of the screen. Follow the on-screen prompts to print payroll checks and/or print direct deposit remittance advices to distribute to employees. Listed below are the frequently asked questions about QuickBooks Online Payroll. If you don’t see your question, head over to our Fit Small Business forum and post your question there. We answer questions posted from small business owners like yourself every day. Can QuickBooks Online Do Payroll? You can pay employees via a handwritten check, print checks directly from QuickBooks Online, or submit direct deposit payments. To start processing payroll in QuickBooks Online, navigate to the Employees tab and click the Add Payroll button to get started. Pricing plans start at $39 per month plus $2 per employee per month. How Much Does It Cost to Add Payroll to QuickBooks? You can add payroll to your existing QuickBooks Online account for as little as $39 per month plus $2 per employee per month. QuickBooks payroll services include payroll checks or direct deposit, payroll tax payments, and all tax form filings. Check out our Intuit Payroll Services guide for more details. How Do You Turn Payroll On in QuickBooks Online? When you’re ready to pay employees, you can activate payroll in QuickBooks Online with a click of a button. Once you are logged into QuickBooks, navigate to the Employees tab located on the left menu bar. 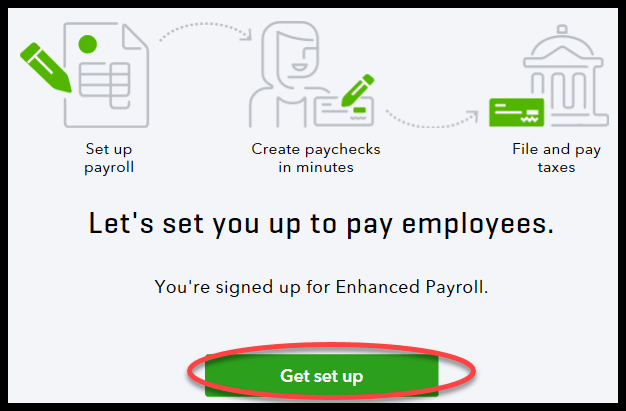 You should see a button that says “Add Payroll.” Follow the on-screen prompts to get started! You’ve got your payroll running like a well-oiled machine now, but you’re not quite done. You’ve still got to get those payroll taxes paid. With each payroll that you run, QuickBooks calculates the amount of payroll taxes that you must remit on behalf of your business and your employees. The key is to make sure you complete and file both the payroll tax forms and payroll taxes by the due date. If you haven’t signed up for Intuit Payroll, you can try it out for free for the first 30 days. During the trial period, you will have full access to all of the features we have discussed in this article. Can I run an interim payroll to pay only bonus to employees mid month and run the normal payroll at the end of the month? Hi Rajdeep, you can definitely run an interim payroll for bonus checks and then run your normal payroll whenever that is due. You get free tech support with your payroll subscription so don’t hesitate to call Intuit and have them walk you through this step by step; that’s what they are there for! The QuickBooks toll free number is activated to share a plenty of information and upgrade instructions to users, which are indispensable for augmenting the performance of the accounting software. Besides, the QuickBooks Support number will help you run the accounting software from a virtual PC to maintain an integration without wasting much of your time and money. Hey Nancy, thanks for providing our readers with this additional info. I would like to thank you for the efforts you had made for writing this awesome article. I have a huge collection of QuickBooks articles which I mymself created to spread awareness about the benefits of QuickBooks Support. Hi Yatin, thanks so much for the positive feedback! It is much appreciated. Hi Eliana, I’m glad you liked our How to Set up & Run Payroll in QuickBooks Online article. Thanks so much for the compliment and for reading! same to you dear !! !